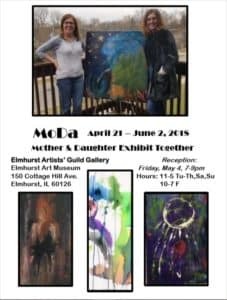 There’s still time to see MoDa: Mother and Daughter Exhibit Together at the Elmhurst Art Museum through Saturday, June 2. The creative talents of mother and daughter artists, Terri Shimkus and Danielle Hepko, are showcased in this unique exhibit. You can see the duo’s collaborative pieces are well as individual art works in the Elmhurst Artists’ Guild Gallery. At Elmhurst Toyota, we encourage support of local artists and the Elmhurst Art Museum. We hope to see you at MoDa: Mother and Daughter Exhibit Together. Terri Shimkus has been creating art since she was a child. She recognized her daughter Danielle Hepko’s artistic talent when Hepko was a young child. The pair collaborated on their first art project when Hepko was 11 years old. That piece, a mixed media painting titled Rainbow Dripping, serves as the inspiration for their current joint exhibit. Among the paintings you’ll see are “In the Stars,” a colorful abstract that mother and daughter created using mixed media, acrylic and oils. Solo pieces are also displayed, such as Hepko’s “Obscured,” which depicts a woman in shadow. Many of the paintings in MoDa: Mother and Daughter Exhibit Together are for sale. Proceeds benefit the artists, the Elmhurst Artists’ Guild and the Elmhurst Art Museum. Tuesday, Wednesday, Thursday and Saturday from 11 a.m. to 5 p.m.
Take advantage of free admission day on Friday, June 1.